News around the web is that the iPod Tough 5G specs and parts were leaked and this is wild fire among the nerd community! 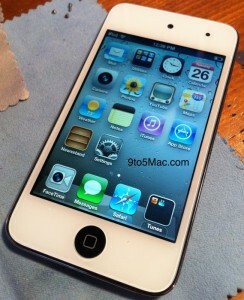 The latest rumour is a spin-off by a 9to5mac report which claims that the parts of white iPod Touch 5G have allegedly leaked in the wild. According to the report, one of its readers have managed to get his hands on the front case of the as-yet-unannounced iPod Touch 5G. There have been many rumors relating to the design and speculated set of iPod Touch 5G features. However, nothing can be confirmed until more evidential details surface. Apple’s response, as usual, has been numb on the issue. The next generation iPod Touch is expected to feature built-in 3G connectivity courtesy of an integrated SIM card, a faster dual-core processor and enhanced RAM storage among other things. Some believe that the new iPod Touch will not undergo a design overhaul while others beg to remain. The upcoming iPhone, on the other hand, is supported by recalcitrant speculations that foresee the possibility of Apple slapping in a larger edge-to-edge display, an 8 megapixel camera, dual-LED flash, faster dual-core processor (as seen in iPad 2), doubled RAM storage, improved graphics, iOS 5 and much more. 9to5mac noted that Apple could just release a white version of iPod Touch with no variation in external design as compared to the iPod Touch 4G alongside the release of the next-generation iPhone. Next FBI? There’s an App for that!